Meet Soledad Duterte and her son Rodrigo. Davaoeños knew her as Nanay Soling. She was one of the most outspoken, most respected and fearless critics of the Marcos dictatorship in Mindanao, and organizer of Davao City’s “Yellow Friday” mass actions. Sadly, there is no monument for Nanay Soling, as is the case for most of the countless Filipinos who bravely took a stand and took action against the tyranny, thievery and terrorism of the Marcoses. Many honor Nanay Soling and the others who, like her, devoted their lives for democracy. Tragically, her son Rodrigo — now the president of the democracy she helped rebuild — wishes to tarnish, distort and invalidate the heroism of Nanay Soling and many other freedom-fighters. Yes, that’s what it means when President Duterte says he favors the Marcoses’ fantasy hero’s burial for the dictator at the Libingan ng mga Bayani. For by according state honors to Marcos and giving him an undeserved place among great soldiers, national artists and scientists, President Duterte joins the Marcoses in whitewashing their corrupt and bloody record, in humiliating the nation that defeated the dictatorship, and in negating the efforts of martial law’s victims and survivors to achieve recognition and obtain compensation. When his victory was apparent after the recent elections, the nation was touched to see incoming President Duterte visiting his parents’ graves. We saw him weep like a child, asking his mother to help him. 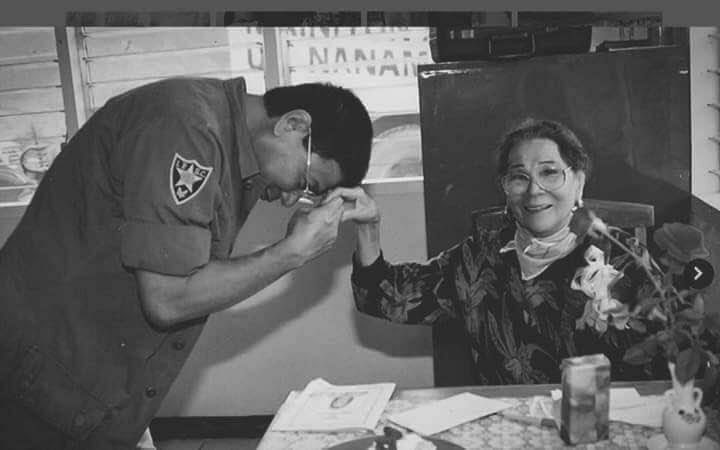 Nanay Soling already “helped” President Duterte in the 1980s by being mother who was also a great freedom-fighter, promoter of democracy and foe of dictatorship. She gave him the immutable power of example to always take the side of democracy, justice and freedom. Frankly, the hero’s burial issue is now no longer about the Marcoses. They who cannot do it on their own even if they have long wanted to. It is now President Duterte’s concern. He approved the preparations. Without his approval, nothing would have happened. It is clearly not a state or legal obligation; not approving it would not make him violate any law or even the Constitution. It is nothing but the whim and caprice of President Duterte, the motivation of which is clear only to him and which his defenders could only guess at best. And so in the names of Nanay Soling and other mothers, of the heroes and martyrs honored at the Bantayog ng mga Bayani, of the many who took to the hills and offered their lives fighting the dictator’s fascist troops, of the 9,539 Filipinos who filed and won a class-action suit against the Marcoses, of the great hero who founded PDP-Laban, and of the new and next generations seeking the gift of clarity and not distortion in history: let’s do everything in our power to stop the hero’s burial for Marcos. May Nanay Soling’s shining example inspire us and her son, and may President Duterte reconsider his morally-bankrupt pro-Marcos decision to instead take the side of democracy, justice and freedom. I do agree about that it is such a great concern for us filipinos to clearly understand abuot this issue former president Marcos does not deserve to be burried in libingan ng mga bayani He left nothing but shame in our history.